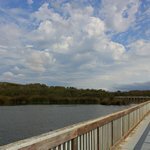 Oso Flaco Lake, California – The wooden bridge built over Oso Flaco Lake provides a beautiful view of the lake. Oso Flaco Lake, California – Sand dunes and vegetation are mixed on the pathway from Oso Flaco Lake to the ocean. Oso Flaco Lake, California – Sandy path leading to the beach from Oso Flaco Lake.